The Piriformis muscle is a small muscle in the buttocks underneath the gluteal muscles. It attaches from the sacrum, the triangular bone at the base of the spine to the hip bone or ilium and allows for external rotation of the thigh. 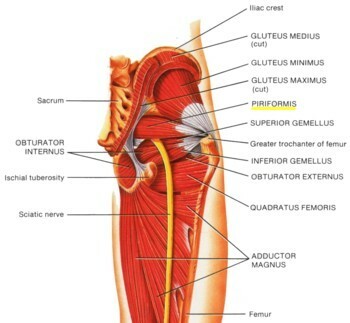 The sciatic nerve exits just below the Piriformis and in about 15% of people actually goes through the muscle. If the Piriformis muscle becomes inflamed or goes into spasm, it can irritate the sciatic nerve and cause pain in the buttock, thigh and/or leg to the foot. It is one of the many causes of sciatica. In order to diagnose Piriformis Syndrome, xrays, CT scan and an MRI may be performed to rule out other problems. Stretching the piriformis muscle will replicate the pain. Treatment is geared towards the relaxation of the muscle and reducing the inflammation. Physiotherapy assists in accomplishing this in combination with chiropractic procedures to remove nerve pressure. Piriformis syndrome can mimmic other common conditions such as herniated/bulging discs and Sacroiliac syndrome. Therefore an examination is necessary to diagnose it along with ruling out the other conditions. Make an appointment if you are suspecting that you have Piriformis Syndrome.